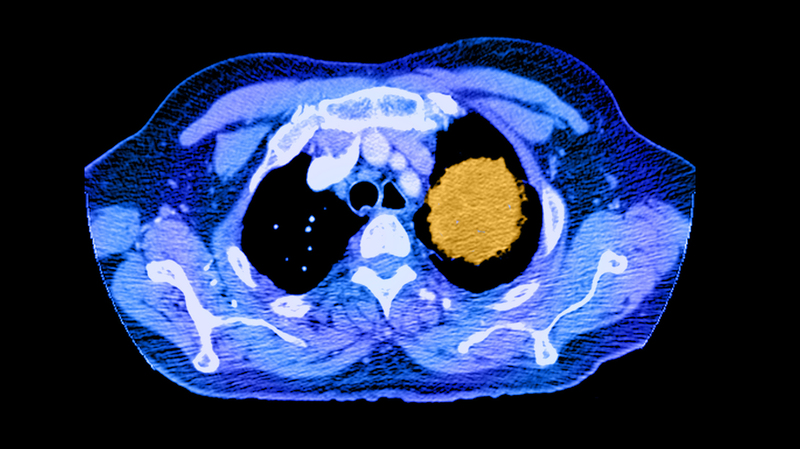 Screening For Lung Cancer Takes A Lot Of Effort To Find A Small Number Of Cancers : Shots - Health News Scanning people at risk for lung cancer finds many nodules that aren't cancerous but prompt more procedures, a study at the VA finds. A small number of people did get their cancer diagnosed early on. A color-enhanced spiral CT image of the chest shows a large cancerous mass (in yellow) in the left upper lobe. Federal officials and other medical groups recommend low-dose CT scans to look for lung cancer among people at risk, generally those over the age of 55 who have smoked at least the equivalent of two packs a day for 15 years. The tests typically cost $300, and they aren't always covered by insurance. Screening does identify cancers, but in the vast majority of cases the test produces false alarms. In the VA study, which was published Monday in JAMA Internal Medicine, 4,246 patients were eligible for screening. About half of them declined to take the test, even though it was offered at no cost. Of those who took the test, about 55 percent of them were told that they had lung nodules, which often involved follow-up appointments and further scans. But very few of those nodules were actually real problems. In the end, the screeners identified 31 cases of lung cancer, about 20 of which were in the early, most treatable stage. The study involved eight of the 150 or so VA hospitals, and was designed to assess the overall benefits and potential harms of setting up a screening program in a large medical institution. So is it a good idea? "I think it's a close call," Kinsinger says. There was a benefit to the 20 or so patients out of this large initial population who had their cancer detected while it was likely to be treatable. "But that has to be weighed against the amount of effort on the part of both patients and staff, and the anxiety, the worry, that a false alarm will cause among patients," she says. "I think a lot of people have a much rosier view of screening in general than the facts bear out," says Dr. Rita Redberg, editor of JAMA Internal Medicine and a cardiologist at the University of California, San Francisco who wrote an editorial accompanying the study. "Very few people are actually helped by screening, and a lot of time there are a number of harms." Another study published in the same issue found that many people getting CT screens are actually at low risk for lung cancer. Dr. Jinhai Huo and colleagues at the MD Anderson Cancer Center compared screening rates before and after 2011, the year of a key study that supported the idea of low-dose CT screening for lung cancer. "Once a [radiology] center has the ability to do this screening, they like to use their technology to do as many people as possible," Redberg says, "and it seems that low-risk people who are really unlikely to get any benefit and are much more likely to get harmed are getting screened in higher numbers than in the high-risk people who are supposed to be screened." Dr. Jorge Gomez, a spokesman for the American Lung Association and an oncologist at Mt. Sinai Hospital in New York, says that while screening low-risk people doesn't make sense on a population basis, it sometimes makes sense for individual patients. And as for the experience at the VA, Gomez says medical teams that have learned to interpret the results of scans can generally weed out false-positive results without resorting to biopsies or other invasive follow-up tests. "There is a concern for unnecessary procedures at institutions where they don't have the expertise in reading these scans," he says. And he acknowledges not everybody has the luxury of going to the top-of-the-line institutions that do this best.